Egyptian President Mohamed Morsi has been toppled at the hands of a military that was the backbone of the Hosni Mubarak regime before the dictator fell. Yet the mass celebrations of Morsi’s downfall in Cairo’s Tahrir Square and around the country represent the real face of this latest stage in the Egyptian revolution. Morsi’s ouster came four days after a day of mass protest involving millions upon millions, as a culmination of the Tamarod (Rebellion) petition campaign to call on Morsi to resign. 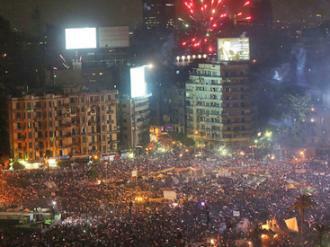 Egyptian revolutionaries say the reach of the June 30 demonstrations was even greater than in February 2011, with immense turnouts in every part of the country. Ahmed Shawki, editor of the International Socialist Review and an eyewitness to the revolution in February 2011, talked to Eric Ruder about what brought about the fall of the Muslim Brotherhood–and the dynamics at play in the next wave of Egypt’s revolution.